Summary: Sixteen-year-old Aza never intended to pursue the mystery of fugitive billionaire Russell Pickett, but there’s a hundred-thousand-dollar reward at stake and her Best and Most Fearless Friend, Daisy, is eager to investigate. So together, they navigate the short distance and broad divides that separate them from Russell Pickett’s son, Davis. Aza is trying. She is trying to be a good daughter, a good friend, a good student, and maybe even a good detective, while also living within the ever-tightening spiral of her own thoughts. Anybody that knows me knows I'm one of the biggest John Green fans around. I loved Looking For Alaska so much that I made it my graduation quote and even decorated my graduation cap with it. So when I found out that a new book was coming, I was beyond excited. Especially since it's been so long since the last one. When John read the first chapter of the book during one of his Vlogbrothers episodes, I even had a response post to that. Needless to say, I am a huge fan of John and Hank Green, so I've been itching to get my hands on this book from the very beginning. And then it happened. And now I am left departing yet another roller coaster of emotions. So, needless to say, I practically bowled down the post room worker when I got the email that my package arrived. I dove into this book immediately, and I couldn't wait to just curl up and settle into another story that I was hoping to love. What I really liked about this book before it was even put in my hands was all of those times where John Green mentioned it in his Vlogbrothers and when he talked about how this book was particularly near and dear to his heart because he has apparently suffered from OCD and thought spirals for many years, and he found a way to express his experiences through Aza's character, which I think was a very brave move and I really respect that. This made Turtles different than many of his previous books, and I was eager to see the change. I also really enjoyed both Aza and Daisy's characters, especially because they were so wildly different. Aza was a lot more quiet and stuck in her own head all of the time, leading the reader through her illness, which Daisy was outgoing, sarcastic, brave, funny, and basically contrasted Aza's character in every way socially. I liked seeing the dynamic of their friendship and seeing that two totally different people were able to remain such good friends even with their opposing natures and their own unique struggles that they were each going through in their life. It made me smile and think back to my own best friends, who are sometimes wildly different than I am but we still click so well, and I really think that is such an interesting phenomenon. Another aspect of the story that I really enjoyed was Davis's. Even if his story was a lot more complicated and it fuzzied the plot further, I really like how he interacted with Aza and her friends, and how he handled everything with Noah. I just really enjoyed the sweetness and the steadiness of Davis's character throughout the book. While he definitely wasn't my favorite (because Daisy's hilarity definitely holds that title), he as another great addition to the story. The only thing I wasn't crazy about in this book was the lack of really gripping drama. There were a few moments (which I will not name here because I don't want to spoil it for you -- go pick up the book yourself! ), but I feel like there definitely could have been more of it than there was. And I'm not talking about Aza's struggles with her thought spirals, because that was prevalent in the book from start to finish. (Okay, I have to spoil a little bit now to make my point, so please skip to the next paragraph if you haven't read this book yet!) For example, there were some scenes like the car accident and Aza cracking and drinking the hand sanitizer in the hospital that made me keep flipping the pages and wanting to see what happened next. But other than those instances, I can't really think of many more that had me gripping the book so tightly and being caught up in the whirlwind of emotion. A lot of the drama was much more subtle, which isn't a bad thing, but I occasionally tend to prefer a little more action. But like I said, that's just my opinion on the subject! If you're not into super action-packed, page-turning reads, this book can change you in so many ways without all of those things. Overall, I really, really loved Turtles All The Way Down and I will definitely be recommending/lending it to friends and family, and of course all of my lovely Twitter friends! If you're on the fence about this book, I definitely recommend at least giving it a try. 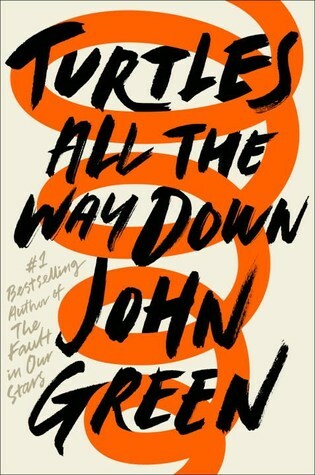 You never know what you may like, and I may be totally biased because I love John Green, but I'm not the only person that's been raving about this book -- so I hope everyone will give it a try and hopefully you'll find an aspect of the story that you like! And now if you'll excuse me, I'll just wait here, patiently awaiting the next John Green book, which probably won't come out until I'm almost in my 30's and have graduated and gone to grad school, at the rate his current writing pace is going. But I will happily wait all of that time, because time and time again, his books captivate me, draw me in, and remind me of why I'm a fan in the first place. This book did not appeal to me, at all. Everybody is raving about it, and I didn't really get it.